Los Angeles is home to a myriad to world class museums with exhibitions of art from all over the world. The Getty Center which opened in 1997 through the trust of J. Paul Getty is no exception. The museum draws 1.3 million visitors each year and is home to illuminated manuscripts, paintings from American, Asian and European classic painters and is architecturally one of the most impressive museums I’ve been to. One of the best things about the Museum? IT’S FREE.However, this week brought with some sort of liquid that comes from the sky (they promised of no such things in southern California), but that wasn’t going to dampened my ambitions of having a weekend adventure at the Getty Center. Upon entering the facilities you come up to the trams that lead you to the main buildings. Everything is very beautiful, the hedges were meticulously trimmed, I suspect Edward Scissorhands had a role in that, and every facade was tiled marble. All very grandiose and awe inspiring even for those that have lived in southern California and are used to the sights, sounds and smells of Los Angeles. The tram itself reminded me of Tommorowland, it was like a past depiction of what the future might look like. Once you’re at the main center, I would suggest putting on your sunglasses; all the buildings are light in color and reflecting on your face hoping to burn a hole through your retinas. There’s no clear way of exploring the museum, after all this isn’t Ikea with their giant arrow guiding you through their sofas. So we figured to just go building to building and see what it had in store for us. Unfortunately in most of the buildings, photography was understandably not allowed. But take my word for it, each room in these buildings can transport you to Russia, the American Prairies to Venice. There were grandiose rooms with ornate French furniture gilded in gold and I could just picture Marie Antoinette in that very room. One of the highlights being a World War I exhibition depicting the timeline of events, with videos and photographs along with soldier gear. 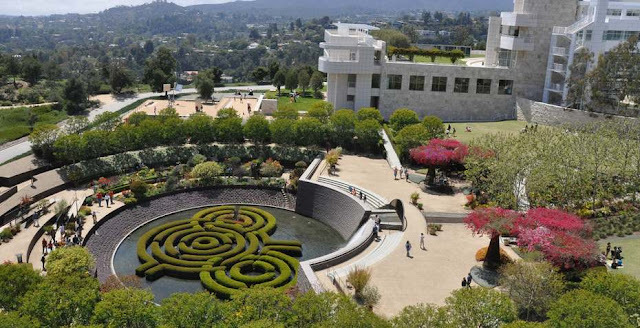 The Getty Center is also known for their grounds and gardens which include a maze like garden which leads to a fountain surrounded by hedges (pictured). Along the way we also ran into a family of ducks, all very cute. There are also hidden gems tucked in corners of the buildings like the Cactus garden. Overall, if you’re looking to have a weekend getaway, look no further than the Getty Center not only because it’s FREE but because it boasts a diverse collection of art from different cultures from around the world. Pro tip: You are allowed to bring outside food and drinks, which I would advise you do because the Getty food prices are comparable to that of a baseball game.